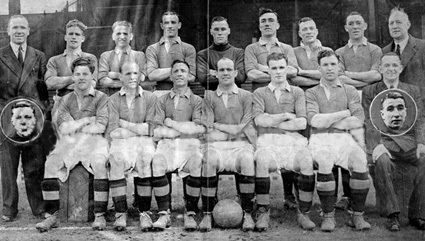 Back row: M Busby (Manager), R Burke, J Warner, A Chilton, J Crompton, J Aston, C Mitten, W McGlen, T Curry (Trainer). Front row: J Morris, J Delaney, J Hanlon, J Carey, S Pearson, J Rowley, W Crickmer (Secretary). Inserts: J Walton, H Cockburn. 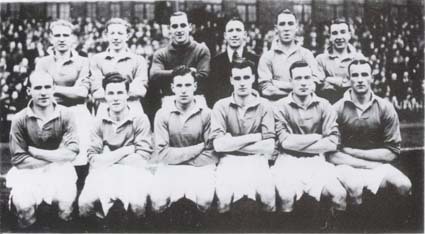 Back row: J Warner, J Walton, C Collinson, M Busby (Manager), J Hanlon, W McGlen, H Cockburn. Front row: J Delaney, J Morris, J Rowley, S Pearson, C Mitten, A Chilton.